While working on several optimization tasks of the player engine, I found out that the player architecture sucked. So I made a major upgrade (well, a downgrade actually since lots of code was kicked out). Let me elaborate what exactly was changed. 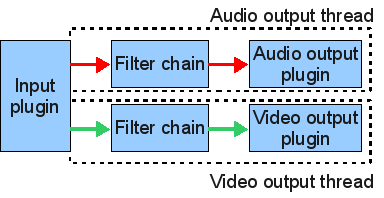 The audio- and video frames were read by the input thread from the file, pulled through the filter chains (see here) and pushed into the fifos. The output threads for audio and video pulled the frames from the fifos and sent them to the soundcard or the display window. The idea behind the separate input thread was that if CPU load is high and decoding a frame takes longer than it should, the output threads can still continue with the frames buffered in the fifos. It turned out that this was the only advantage of this approach, and it only worked if the average decoding time was still less than realtime. The major disadvantage is, that if you have fifos with frames pushed at the input and pulled at the output, the system becomes very prone to deadlocks. If fact, the code for the fifos became bloated and messy over the time. Frame skipping is the next major thing to do. But with the new architecture it will be much simpler to implement than with the old one.